Social equity - access to safe water resources is essential to all human beings and a human right. Transparent and equal water right systems allow for equal access. A sustainable long-term usage of water resources is in the interest of all users, also with regard to the availability of the resources for long lasting investments in the agricultural sector. Hence, all users should have an interest to set up a functioning institutional environment that safeguards water resources and guarantees water security for agricultural irrigation purpose. Essential parts of public administration of water resources are water management planning and water regulation. Water management planning is generally undertaken at a basin level by water ministries or basin organizations. At best, a water management plan integrates the needs from all relevant sectors (drinking water, sanitation, irrigated agriculture, industry, environment), matching the available resources with actual and future demands. Apart from water planning, agricultural authorities (e.g. ministries) may also formulate irrigation development plans that may define priority areas and goals for irrigation development. Water resource management is the activity of planning, developing, distributing and managing the use of water resources. Sustainable water resource management has regard to all the competing demands for water and seeks to allocate water on an equitable basis to satisfy all uses and demands. Observing the principal of a sustainable yield of aquifers is the foundation for the long-term sustainability of water resources development and use..
Water resource regulation is generally based on national law and a set of sound rules and institutions that govern the monitoring of its quantitative and qualitative state, use of the resource, preventing overuse and pollution of the resource as well as guaranteeing its fair distribution among different users and interests. In many places, public water authorities on different governmental levels are in charge of the supervision of water resources. Based on water and environmental laws, these authorities regulate water use, e.g. issuing water rights and licenses for wells and water infrastructure. In many countries, also non-state institutions (self-)regulate water use, such as water user associations. These may be based on local customs and traditions about the use and distribution between the owner of the source and its users. The information compiled in this process step will be the basis for the technical and agronomic design and planning in following modules. If correctly applied, this process step will also reveal opportunities and limits for the envisaged irrigation development at the earliest point in the SPIS development stage. The process step “Analyze Water Management and Regulation” is interlinked with the following process steps “Analyze Water Extraction” and “Explore Cooperative Water Governance” - all three process steps define the framework in which the SPIS can be developed from the point of view of a sustainable water resource management. “Analyze Water Management and Regulation” is based on the collection of information, data and salient features of the source, the water tenure and the legal situation with regard to water permits and licenses. The objective of this exercise is to obtain a clear and legally secure picture with regards to which water source could be exploited, to water tenure rights to be obtained, and to the limits with regard to water abstraction. The SAFEGUARD WATER – Water Resource Management Checklist of this toolbox provides for an orientation for the information and data to be collected and reviewed in section 1. This section of the tool requires compilation of information from public authorities, water management bodies and user groups. Water permit details and licensing aspects: the right to withdraw water from the specific source must be based on a legally recognized water permit or water license. The existence of such a legal provision for water withdrawal is the principal determinant for any irrigation development. It also determines quantities (annual quantities, or monthly quotas), conditions and restrictions issued by the water authorities. 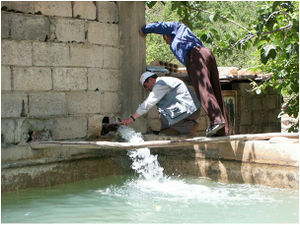 The information can be obtained within the authorities/organizations that are managing water licenses and permits. Important: The information and data required for this process step should be obtained from legally recognized and verified sources. Do not base decision-making on information obtained from secondary sources without proof. Also informal agreements should incorporate all important information as prescribed by the public authorities, most importantly access rights, abstraction quotas and restrictions/conditions. A water withdrawal license is mandatory! No SPIS design and planning must take place before a withdrawal license has been obtained! Any SPIS design and planning must be based on the quantities allowed and conditions prescribed by a legally recognized water withdrawal license! Assessment of principal possibility to develop SPIS based on a specific water source. Information on type and details of water withdrawal license. Informal agreements should be legally registered and recognized. Farmer Organization / Water User Group. This page was last modified on 3 April 2018, at 16:57.